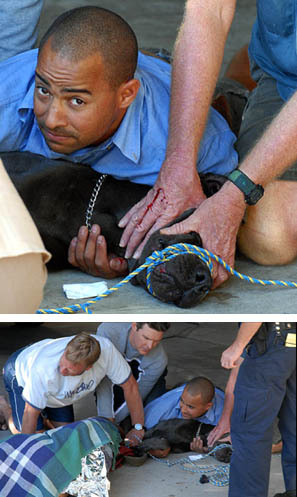 AUSTRALIA -- The bravery of a workman to save a woman from having her arm torn off by a large mastiff dog received high praise in Noosa Magistrates Court. While at the same time Magistrate John Parker castigated the dog’s owner for not even bothering to turn up to cop a $2,000 fine and $1,500 in court costs. 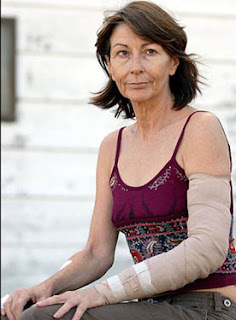 Noosa builder Dion Gadd on the afternoon of June 6 last year crash-tackled the frenzied dog that was mauling Julie Harris’s left arm in the basement carpark of the Noosa News building at Noosa Junction. She was also bitten on her other hand and arms, legs and tail bone. But before the charge against Jo-Ann Tesch proceeded in her absence, Ms Harris gave Mr Gadd her heartfelt thanks. “It took a special person to pull me out of the jaws of that dog and you were that special person. “I want you know that if you didn’t, I probably wouldn’t be here today. “You saved me and that’s what matters – you know how close it was to going right through the bone. Ms Harris compared Mr Gadd’s actions to “jumping in the water and taking me out of the mouth of an eight foot tiger shark”. Mr Gadd tried to shrug off the attention. The magistrate also noted it took considerable bravery for Mr Gadd to put his fingers in the dog’s mouth to eventually free Ms Harris after a four-minute ordeal in which she saw the dog swallow pieces of her flesh. Mr Parker ordered the Noosa Council case against Ms Tesch proceed after she called to say that she would be 90 minutes late for the 9.30am start because of an appointment with a Building Services Authority official. When a court official rang back to advise to get to court by 10.15am, she was apparently out buying milk. Mr Parker said that Ms Tesch was treating the court in a very cavalier fashion. Council solicitor Steve Courtney said just before the attack, Ms Harris had returned to the vehicle containing Ms Tesch and the dog. The court heard the dog, which had exhibited earlier aggressive tendencies towards Ms Harris, may have been agitated by the fact that she had answered the phone of Ms Tesch. When she opened the door, the dog lunged from the back of the vehicle, knocked her down and dragged her for up to 20 metres through the carpark. Eventually it took three men to restrain the dog, which was shot at the rear of the carpark by a police officer on the order of a police inspector. Mr Parker found the actions of police to be appropriate under the circumstances. He said the dog attack was aggravated by the fact that this large and strong mastiff was of a breed noted for its fighting qualities and Ms Tesch had not properly restrained it. Mr Parker said that the dog owner had showed no remorse while Ms Harris now suffered from post traumatic stress syndrome and an adjustment disorder. He said the victim’s arm would never be the same again and would require skin grafts. Ms Harris, who has had three operations since the attack and is unsure about undergoing more than $50,000 worth of plastic surgery. The court was told that civil action is being taken in this matter. Owner: "I'm not to blame for dog attack"
FLORIDA -- It wasn't the first time animal control has removed dogs from her home. Complaints from neighbors about barking led Boynton Beach police back to Marta Pejouhy's home where they removed 22 dogs and a cat Tuesday. The dogs looked healthy and well-fed but were being confined inside the house in unsanitary conditions, said Liz Roehrich, animal control supervisor for the Boynton Beach Police Department. "She has fans, but the air quality is poor. There is a stench of urine and feces," she said. Pejouhy said she is being unfairly targeted. She knew the number of dogs was out of hand, but she could not turn them away when people brought them to her, she said. She takes the dogs in when others cannot care for them. "I love the dogs," said Pejouhy, 70, who plans to fight to get them back. "I don't want them to get hurt." She has not been charged yet, Roehrich said. "She has an extensive history of this," Roehrich said. "Despite the consequences, she continues with the hoarding behavior." Boynton Beach residents can have no more than 10 dogs and cats on a residential property, Roehrich said. Court documents show that Pejouhy has been convicted twice of unlawful confinement of animals, a first-degree misdemeanor. In 2000, 37 dogs were seized from her home, in the 100 block of Southeast 28th Avenue. Pejouhy pleaded guilty to unlawful confinement of animals and was placed on probation, according to court records. A year later, 11 dogs were removed from her home. She again pleaded guilty to unlawful confinement of animals. Pejouhy's neighbors agree that she means well, but her actions are a little misguided, said Page Trieste, 24, who lives across the street. "I hear them barking but it doesn't bother me," she said. "I'm sure they take good care of the dogs but it's just too many for the home." "This is a nightmare that's been going on for years. I can't use my backyard," said Gary Giles, 53, whose back door is about 60 feet from Pejouhy's back door. "It would be nice to end this madness." Giles does not expect that to happen. "She'll have dogs back in that house within a week," he said. "Her intent is good. The dogs are healthy-looking and fed, but they don't get any exercise." The dogs taken from Pejouhy's home were being held by Palm Beach County Animal Care and Control until a judge decides who will get custody, Roehrich said. ARIZONA -- "Anybody could come to my place and look at my animals. They made me sound like I'm torturing animals," commented Carole Saunders, 70, of Ash Fork. Saunders continues to fight allegations that surfaced this past December when Yavapai County Sheriff's Office deputies booked her into the Yavapai County Jail on 21 counts of animal cruelty, one count of interference, one count of unlawful interference with a county agent and violation of probation. According to William Fortner, Saunders' attorney, Mayer Justice Court Judge John Kennedy dealt a devastating blow to Yavapai County Animal Control on Oct. 24 when he ruled that prosecutors had failed to prove, by even a preponderance of the evidence, allegations that Saunders committed the offense of cruel animal neglect. Fortner expounded on his interpretation of Judge Kennedy's ruling. "In light of the uncontroverted evidence that Ms. Saunders had never cruelly neglected or abused any animal, Judge Kennedy took her off probation 11 months early. He advised her that she was free of any legal restraints on taking care of her animals as long as she complied with the Arizona statutes on the proper care of animals." "I am still reeling in shock from the discrepancies and false information that was in Fortner's press release," commented Sgt. Deb Dean, YCSO animal control. Fortner said in his press release that Dean testified there was no cruel animal abuse or neglect to any of the animals in Saunders' care. "We didn't even deal with the 21 counts of animal cruelty," she said. "The only date discussed in court was our visit in November 2005 to see her animals because of a probation violation. And Saunders had clearly violated the terms of her probation." Dean said that animal control has been dealing with Saunders since 2001 and she has violated her probation several times. "We've tried to work with her to improve the situation," she said. Over the years, probation officers have cited Saunders with counts of animal cruelty including no food, water, shelter or vet care. The county attorney's office offered its own version of the hearing. "Carole Saunders has not been cleared of the charges for the December 2006 contacts and this office is still reviewing the matter," stated Sheila Polk, Yavapai County attorney. "Because Ms. Saunders was already on probation under a court order concerning previous animal neglect issues, we had hoped to handle the new conduct through the existing plea agreement and probation proceedings." "We had a probation violation hearing on Oct. 24, 2007, wherein Judge Kennedy did in fact find her to be in violation," Polk explained. "We then asked the judge to place her on supervised probation, order counseling, limit the number of animals she can lawfully possess and set her up on periodic checks by adult probation department and animal control unit. Instead, Judge Kennedy terminated her probation and ordered her to pay a fine of $1,000. "In light of that proceeding, we are now reviewing the December charges and will make a decision how to proceed shortly," Polk added. Saunders volunteered her side of the story. She stated that she had showed horses while living in Scottsdale before purchasing land in Ash Fork and moving there seven years ago. "Two weeks after I moved in, Livestock shows up saying they had a report that all of my horses were stolen," she said. "That was odd because I had all of the registration papers here. I believe it was a false report. But they would not say who it was." According to Saunders, animal control officers began coming to her property every month because they received complaints that she was not feeding or providing water to her horses. "They wrote reports saying there was no food, water and the horses were dying," she said. "I was in court once a month. They harassed me for seven years. I had a feed building. My horses and dogs had shelter." According to a Yavapai County Sheriff's Office report, however, Seligman Justice Court Judge Kathy Blaylock signed an order on April 12, 2006, placing Saunders on probation for 36 months and limiting her to possession of no more than five dogs and no cats. Then, on Dec. 4, 2006, one of Saunders' neighbors complained to YCSO about barking dogs on Saunders' property and raised allegations of animal neglect. The neighbor reported that there were 10 horses, seven dogs and an unknown number of cats on Saunders' property. Deputies responding to the neighbor's complaint found the dogs' water bowls filled with ice. Eight of the 10 horses had no water. Saunders explained that she had not yet gone out to water or feed the animals that morning. Deputies also found more than 10 cats in the shed. "I tried to get rid of the cats," Saunders said. "Many were feral and came wandering through." During subsequent visits to Saunders' property, deputies continued to find that the dogs and horses did not have any water. According to reports from the deputies, the animals started drinking the water as fast as a deputy could fill their bowls. Saunders maintains that she did not neglect her animals. In her version of events, Saunders recounted how deputies would kick over the dogs' water bowls and then ask her how many days had the dogs gone without water. "I finally saw Fortner," she said. "They pushed me too far and arrested me in church. The men did a weapons search on me and took my jewelry off. Where is my jewelry now? They threw me in jail on a Sunday and I was terrified my animals would be gone. I was never told of my rights, I never pleaded guilty. There was no hearing and no evidence." "I was spending over $1,000 a month at Olson's for grain," she added. "I've got letters, bills and records and no one would look at them. I still don't know why this happened." During January 2007, deputies contacted several feed stores in the area to check on hay purchases by Saunders. Employees at two of those stores seem to support Saunders' story. They said that they are involved in civil suits against Saunders, seeking payment of outstanding balances she owes for grain purchases. A spokesperson for Olson's Grain in Chino Valley said that they would sell grain to Saunders only if she had cash or a valid credit card, and that the church usually purchased the hay for her. "I believe my Constitutional rights were violated," Saunders said. "Fortner calls it a witch hunt. Who is doing this? Do they want my land? Do they want my horse? They may call me an old woman, but I'm a sharp old woman." Saunders has filed a lawsuit in federal court against Yavapai County Sheriff's Office and People for the Ethical Treatment of Animals (PETA). 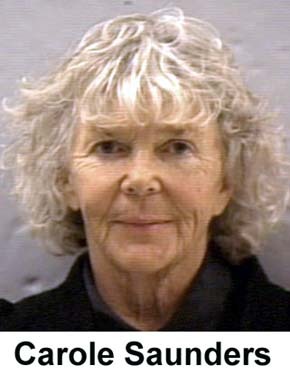 PETA became involved in December 2006 when it sent a letter to Polk about its concern that Saunders may be an animal hoarder. "They just think I'm an insane old woman who had to be incarcerated for her own protection," Saunders added. Carole Saunders, Plaintiff, v. Yavapai County Sheriff's Deputy Richard Silva and his wife, Connie Lynn Silva; Yavapai County Sheriff's Deputy Deborah Dean and her husband; Yavapai County Sheriff Steve Waugh and his wife; Yavapai County Attorney Sheila Polk and her husband, Thomas Polk; Yavapai County Deputy Attorney Steven Sisneros and his wife, Kasie Sisneros; and Yavapai County, Defendants. Did Jonathan Babineaux's association with the NFL sway the DA's office? GEORGIA -- Jonathan Babineaux expressed relief Wednesday after he was cleared of a felony aimal cruelty charge that could have sent the Atlanta Falcons defensive tackle to prison. "I'm just happy the whole situation is over with," Babineaux said. "It's been a long process. I've been waiting it out and it's finally over." Gwinnett County District Attorney Danny Porter said Wednesday he dismissed the charges following an investigation of the death of a pit bull in February. Pat McDonough, Babineaux's attorney, said it proved Babineaux acted only in self-defense against the aggressive dog that belonged to the player's girlfriend. McDonough said Babineaux was protecting himself and his 5-month-old child. "This was a clear case of self-defense," McDonough said. "The dog had a history of violence. ... Jonathan and his family did everything in their power to make this dog part of their family." McDonough said the dog had been neutered, placed on Prozac, sent to a dog trainer and kept on a leash. Porter said his office's investigation confirmed the dog's history of unprovoked attacks. "There is not enough evidence to exclude every reasonable hypothesis other than the guilt of the accused," Porter said in a statement. McDonough gave details of how Babineaux was advised by a dog trainer to spin the dog on a leash when it became aggressive. "You pull the chain taut and then you spin in a circle," McDonough said. "It's supposed to disorient the dog a little bit, which then allows you to gain control and protect yourself or protect your family or whoever is in danger." After the charges, People for the Ethical Treatment of Animals said it sent a letter to Falcons owner Arthur Blank asking that Babineaux be suspended. "I don't think anybody is more relieved than Jonathan," McDonough said. "Literally the district attorney was looking at prison time for a case like this. ... People really had convicted him before they had all the facts." The Falcons have been involved in the more publicized case of quarterback Michael Vick, who faces sentencing in December after his guilty plea on federal dogfighting charges. Vick has been suspended indefinitely by the NFL. "I'm sure there was a lot of pressure on the Atlanta Falcons to disassociate themselves with someone like Jonathan, but they stood by him until the truth was able to come out," McDonough said. PETA didn't back off its criticism of Babineaux on Wednesday. "The fact that a dog died at Babineaux's hands is further proof that the NFL must address the issue of cruelty to animals with the entire league," PETA spokesman Dan Shannon said in a statement. "No matter the circumstance, a grown man who beats an animal a fraction of his size to death clearly has no concept of humane treatment of animals or self-control." Gwinnett County Police arrested Babineaux on Feb. 19 after Blair Anderson said she and Babineaux argued at their home. She said she went to the movies, and when she returned, she found the year-and-a-half-old dog named Kilo in "severe physical distress." It's very convenient that after arguing with his girlfriend, he beats her dog almost to death and then claims self-defense? Why didn't he immediately take it to a vet - if he were telling the truth? 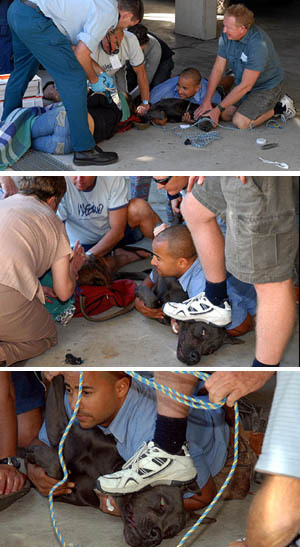 This is clearly a domestic violence case - he took his rage out on this dog and beat it to death. Following the arrest, police said Babineaux's account of what happened was inconsistent with information provided by the animal hospital about the dog's injuries. Said Babineaux on Wednesday: "The main thing is my name is cleared from the whole ordeal. That's where I'm at right now. I'm just happy this whole thing is over." Falcons coach Bobby Petrino also expressed relief. "He's a first-class young man who has been great since I've been here and I'm just really happy for him," Petrino said.